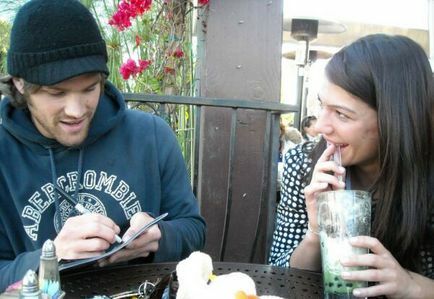 Jared Padalecki of Supernatural and Gilmore Girls fame married one time co-star Genevieve Cortese who played a demon named Ruby on his hit CW show. The 27 year old heart throb married Cortese in her hometown of Sun Valley, Idaho. Jared’s best man was his brother Jeffrey Padalecki, but co-star and best friend Jensen Ackles was one of his groomsmen. Most of the wedding party seemed to be rounded out by family members from both sides of the aisle. I’ve recently became a fan of Supernatural. I didn’t give it much of a shot its first season, and quit after a couple episodes. However, I recently watched all the seasons on DVD, and have now caught up to the current episodes, and I’m loving the overall mythology to the series. It might actually be a show that I want to buy for my collection. I highly recommend it if you like a show with good horror elements, great chemistry between the cast, some really funny moments, and a great mythology. It does bother me a little that apparently only good looking people are involved in supernatural accidents and such, but I guess that is the one downside of it being a CW show. 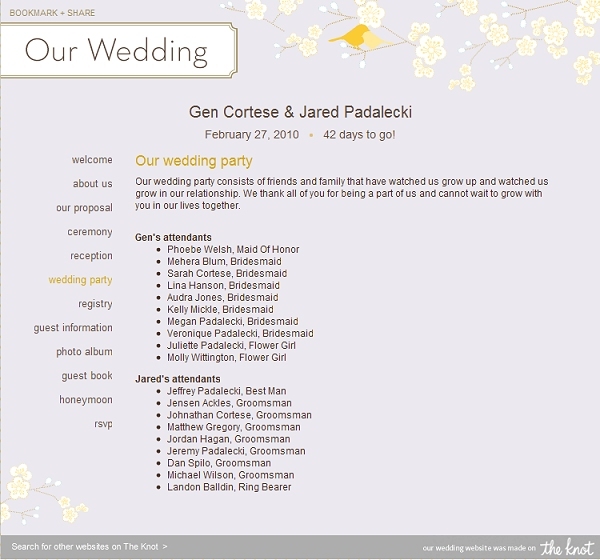 Here is a list of their wedding party, taken from a screenshot of their password protected wedding website.